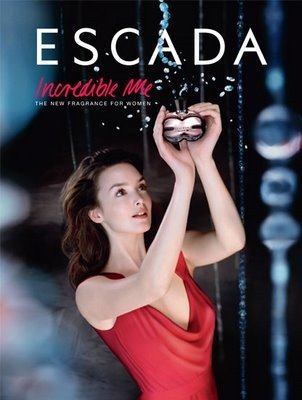 The soul concept of Escada Incredible Me, a girl who lives in present and want to enjoy every second. Fun is her goal and the world is her playground. She is confidant and she lives every day as if it’s her birthday and each moment as if there is no tomorrow. She thinks future is bright but today is simply fabulous. Escada Incredible Me was inspired by tiramisu. Have you ever smelt a truly delicious tiramisu? Vanilla, marsala, mascarpone cheese……………… it is truly divine and this is what Incredible Me offers. Its packaging is simply appealing by its large logo, along with black gloss, pink juice and jewel cap which convey beautiful feminity. No opaque pastel shades here, the cape however is gorgeous. It looks just like a gem so if you imagine this on your vanity table it looks a right treat. Incredible Me is a vanillic oriental with fragrance notes of Clementine, honeysuckle, orchid, vanilla and sandalwood. An innovative fragrance with perfect bend of Asian exoticism and European comfort. A modern and imaginative sensuality that unites east with west.